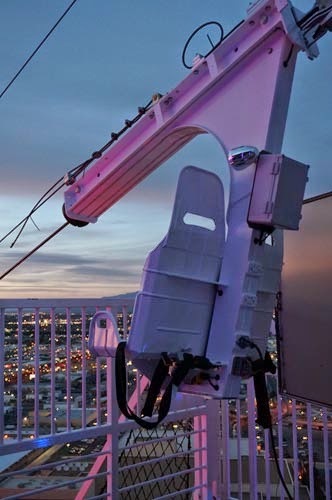 The VooDoo ZipLine connects the two towers of the Rio All-Suites Hotel & Casino Las Vegas. It begins on the patio of VooDoo Steakhouse on the 50th floor of the Masquerade Tower and soars towards the Ipanema Tower. 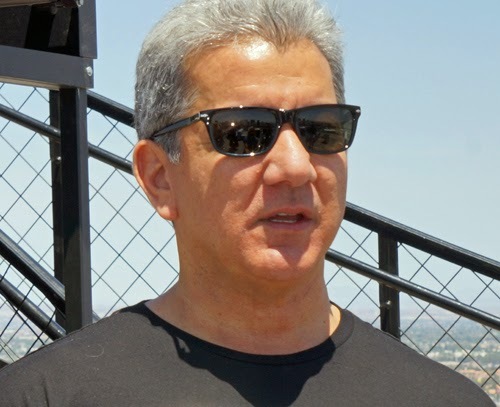 The VooDoo ZipLine Grand Opening was hosted by UFC announcer Bruce "It's time!" Buffer Sunday, May 25. He was the first to ride the ZipLine and announced the ride's official opening from 500 feet above ground. Local residents and tourists showed up today to experience this one of a kind zip line. Some tourists came from far away just for the ride, like Van Kim. He heard about the grand opening and came from Phoenix to be one of the first to ride the VooDoo ZipLine. The VooDoo ZipLine connects the two towers of the Rio All-Suites Hotel & Casino Las Vegas. It begins on the patio of VooDoo Steakhouse on the 50th floor of the Masquerade Tower and soars towards the Ipanema Tower. Riders are then propelled at speeds of up to 33 miles per hour from the adjoining 20-story Ipanema Tower and travel backwards to the Masquerade Tower. VooDoo ZipLine opens to the public from noon to midnight Monday through Thursday and 10 a.m. to midnight Friday through Sunday. Pricing is officially listed at $24.99 per person from noon to 5:30 p.m. and $37 from 5:30 p.m. to midnight. That pricing does not include tax and service fees. You'll need to be 21 or older to fly after 8:30 pm. You can wait somewhere else for your ride, you will receive an alert on your cell phone when your reservation is ready. by phone: 702 388-0477 and 866 746-7671. Note: Worth visiting the VooDoo Steak & Lounge. It is an absolutely beautiful the view of the Las Vegas. Even the view from the elevator has a breathtaking view. Macumba developed in Brazil amongst the slave community which was brought to Brazil from Africa between the 16th and 18th centuries.